During this scorching season, your body just seems to scream for a refreshing cold drink to survive the sweltering heat. 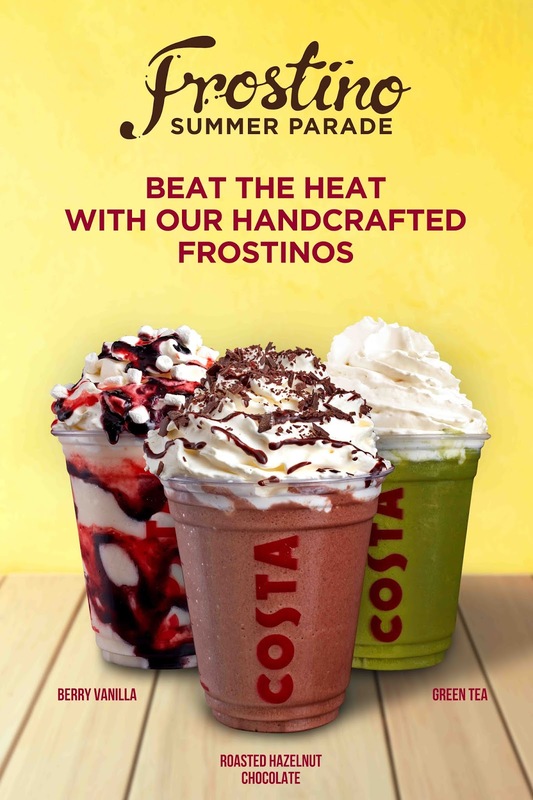 It’s time to grab a Costa Coffee Frostino, a range of ultimate thirst-quenching ice blended drinks, and new desserts that are perfect for the hottest days of the year. Don’t’ settle for anything but the best Frostinos, handcrafted iced blended drink with a difference! Inspired by hazelnut, green tea, coffee cream, berries, mint and summer-y flavors, these decadent drinks are enough to whip you up with that certain amount of London cool. Plunge right into your very own chocolate haven with the Roasted Hazelnut Chocolate Frostino. One sip and you’ll be soothed from the sizzling hot sun, London-style. A carnival of sweetness is also offered by Costa Coffee’s medley of dessert-inspired drinks such. Start the ride with the Tiramisu Frostino, made with the signature Mocha Italia espresso blended with cookie pieces, and topped with whipped cream and chocolate dusting. Then there’s the Caramel Crunch Frostino, an ice blended drink that’s mixed with cookie pieces then topped off with caramel drizzle and chocolate curls. Another indulgent treat is the Double Chocolate Cookie Mocha Frostino, a cheery blend of fresh espresso, milk, and ice, with chocolate and cookie pieces and chocolate cream and sauce drizzled on top. Costa Coffee has also perfected the rich taste of creamy and velvety. The Coffee Cream Frostino, an irresistible classic with creamy Mocha Italia. There’s also the Mocha Cream Frostino, a perfect blend of coffee and chocolate. The Mint Choco Chip Frostino is a minty chocolaty hit. Take pleasure in Green Tea Frostino, a smooth cup of ice blended green tea balanced with vanilla that will remind one of the relaxing zen. The Berry Vanilla Frostino, on the other hand, is a mixture of strawberries and blueberries flavored with vanilla bean topped with whipped cream and fluffy marshmallows. You can also the Raspberry Yoghurt Frostino, a sweet and creamy way to relish the summer breeze. For the perfect pairing, raise your glass to these new cakes that will round up your summer meal. The Milky Cheesecake, a combination of creamy cheesecake and chiffon cake, generously slathered with melt-in-your-mouth Parmesan cheese, is a must-try. Another treat is the Honeycomb Cake that’s made of layers of caramel custard, smothered in chocolate ganache, whipped cream topped with shards of chocolate honeycombs. Lastly, there’s the Choco Midnight Cake, a duo of moist brownie cake and smooth Belgian chocolate mousse. Summer is in full swing and Costa Coffee’s Frostinos and new cakes are ways to enjoy the season through sips and bites that perk you up and cool you down! Costa Coffee branches are located at Robinsons Galleria; Robinsons Supermarket, Robinsons Galleria; Robinsons Place Manila; Robinsons Supermarket, Robinsons Place Manila; Robinsons Place Antipolo; Robinsons Magnolia; Robinsons Selections, Venice Grand Canal; Robinsons Equitable Tower; Robinsons Summit Center; Cyber Sigma, McKinley West; Robinsons Summit Center; Tera Tower, Bridgetown; Citywalk 1, Eastwood; UP Town Center; SM City Manila, The Block, SM North EDSA and Robinsons Metro East opening on May 4, 2018. You may follow Costa Coffee Philippines on Facebook, Instagram and Twitter for more updates.